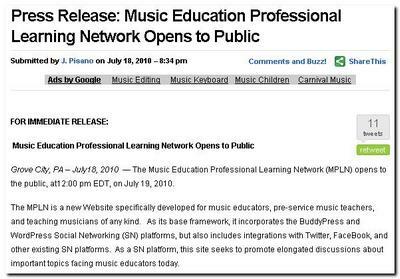 It’s official -the MusicPLN.org site launches today! It has been a long road getting ready and I am very excited that this day has arrived. If you’ve missed the tremendous excitement and anticipation about this site and consider yourself a”connected music educator”, then you must have been on an extended sabbatical or something! The official Press Release may be found by clicking here, feel free to Re-Tweet, Re-Buzz, and Re-publish it in anyway. …and, I would like to thank all of the members of the BETA team for helping test the site out (and finding even more bugs!). You have all done “Yeoman’s work!”.